The graves in the jungle yawned open to the rains and a haze of mosquitoes still buzzed around the surgical masks and rubber gloves left by the team that had dug up the bodies to take them away. This is Thailand’s shame, the final destination for Rohingya Muslims who fled hatred in Myanmar but fell into the hands of human traffickers and met their end through sickness, starvation and murder. In a week of appalling ­revelations, the Thai military ­government finally acknowledged that its own policemen and officials were in league with gangs who preyed on some of the most ­vulnerable people on earth. Death camps have come to light where the traffickers ­imprisoned desperate migrants in bamboo cages, forcing them to call their impoverished families for ransoms many could never pay — typically about $4000. There were 26 graves at this one spot outside Padang Besar, ­a town that nestles in the lee of ­Elephant Mountain, along the forested border with Malaysia. I counted three about the right size for a child. The most shocking thing about the site is six shallow graves lie so close to the road that local villagers must have known about them. But just five minutes away in the nearest hamlet, which is ­inhabited by Thai Muslims, the locals shook their heads, vanished into its tiny mosque or pointed ­inquirers in the wrong direction. Last weekend, Banjong Pongphon, the mayor of Padang Besar, was arrested on suspicion of ­involvement with human ­trafficking, the police announced. The authorities issued 29 ­arrest warrants for alleged traffickers and transferred 58 policemen suspected of collusion with them. An army colonel has been sacked from his local ­command. On Friday night, Prime Minister Prayuth Chan-ocha pledged in his weekly television address to stamp out the rackets for good. General Prayuth knows this is a national crisis. Thailand already risks a EU ban on its vital exports of seafood after the exposure of human trafficking and slave ­labour on its fishing fleet. The US State Department last year gave it a “Tier 3” rating, the worst possible, for failing to fight the trade, raising the threat of sanctions. After years of inaction, squads of police and soldiers began sweeping the dense jungles last week and found four camps holding 50 makeshift dormitory huts. They rescued 55 survivors but the other hostages and their captors had vanished. A total of 56 graves have been located and more are being found by the day. “We were called by villagers and found 13 Rohingya wandering in a rubber plantation,” said police Colonel Supachai Fuenpanich at a rural police post about 16km from the border. His men led the haggard, ­dishevelled migrants, none of whom could communicate in English or Thai, to a van, which then took them to a court hearing. They will be treated as illegal immigrants and are likely to end up in a detention centre where the food is so sparse that a local ­Muslim charity sends in meat, fish and eggs to stave off malnutrition. They had told an interpreter of being lured by traffickers with tales of jobs in Malaysia paying about $20 a day and the promise of safety in that mainly Muslim country. “They said they came in large and small boats, taking 10 days to cross from Myanmar and then they were five or six days in the Thai jungle,” the colonel said. The Rohingya are Muslims from Myanmar and Bangladesh, where they are often stateless and victims of racial hatred. In Myanmar, mobs incited by Buddhist extremists turned on them, leaving terrified survivors living in isolated conditions that have been compared to apartheid. Tens of thousands crammed on to fishing boats and rickety cargo vessels in an exodus across the Bay of Bengal, hoping to reach Malaysia, where more than 35,000 have already sought refuge. Along the way, a terrible fate befell some. A Pulitzer prize-­winning investigation by Reuters news agency in 2013 found that Thai immigration officials sold them to traffickers for as little as $400 each to get rid of the ­problem. 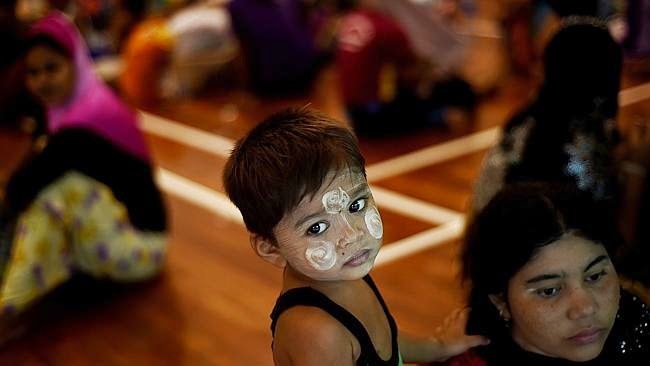 The Thai government still ­refuses to allow the UN’s refugee agency full access to the Rohingya to determine whether they qualify as refugees. Many victims are shipped ­offshore to slave hulks or remote islands. Despite pleas for action against the trafficking ships, ­nothing has been done. Instead, the Royal Thai Navy has filed a criminal defamation case against an Australian journalist, Alan Morison, and his Thai ­colleague Chutima Sidisathian for their reporting of the issue on a local news website, Phuketwan. “Trafficking of persons in Thailand has long been out of control,” said Brad Adams, Asia director of Human Rights Watch.